May. 31, 2017 | May 31, 2017 | Erick Messias, M.D., Ph.D., M.P.H., has been appointed associate dean for faculty affairs in the College of Medicine at the University of Arkansas for Medical Sciences (UAMS). Messias is rejoining the UAMS faculty and will also be an associate professor in the Department of Psychiatry, where he served in a number of leadership positions from 2010 to 2015. Messias replaces Jeannette M. Shorey II, M.D., who was appointed associate provost for faculty in 2015 and served in both roles during the search for her successor. As associate dean, Messias will lead College of Medicine faculty processes related to recruitment, evaluation, promotion and tenure. He will advance the college’s efforts to support faculty development and foster professionalism. He will work closely with Shorey and the UAMS Faculty Center as the College of Medicine’s representative on the Intercollegiate Faculty Council. “I am thankful for this opportunity to apply my training and experience in this new role, with the goal of improving support and opportunities for UAMS faculty as they advance through their careers in academic medicine,” Messias said. “I have big shoes to fill in Dr. Shorey and look forward to collaborating with her and the UAMS Faculty Center to provide support and tools so we can continue to improve the training and education of the health care workforce for Arkansas. 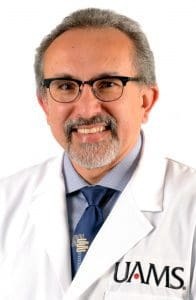 During his previous tenure at UAMS, Messias served as medical director of the Walker Family Clinic, director of the House Staff Mental Health Service and director of the Brain and Behavior course for medical students. He has received many teaching awards and other accolades. After leaving UAMS, Messias served as vice president and medical director of Beacon Health Options Arkansas. Messias received his medical degree from Federal University of Ceará in Brazil in 1996. He completed his residency in general psychiatry at the University of Maryland/Sheppard Pratt Program. Messias went on to earn a Master of Public Health, complete a residency in preventive medicine and obtain his Ph.D. in psychiatric epidemiology at the Johns Hopkins University Bloomberg School of Public Health. Messias was an assistant professor of psychiatry at Johns Hopkins School of Medicine during his final year of work toward his doctorate. He returned to Brazil for two years, practicing psychiatry while also serving as an assistant professor of medicine at the Federal University of Ceará School of Medicine. From 2007 to 2009, he was an associate professor in psychiatry and in biostatistics at the Medical College of Georgia. He also served as medical director of an acute adult psychiatric unit and associate director of psychiatry residency training until his recruitment to UAMS.